2018 was one of the busiest years we have had to date, with over 431,000 visitors, 8 exhibitions and 300 + events taking place throughout the Dublin Castle complex. 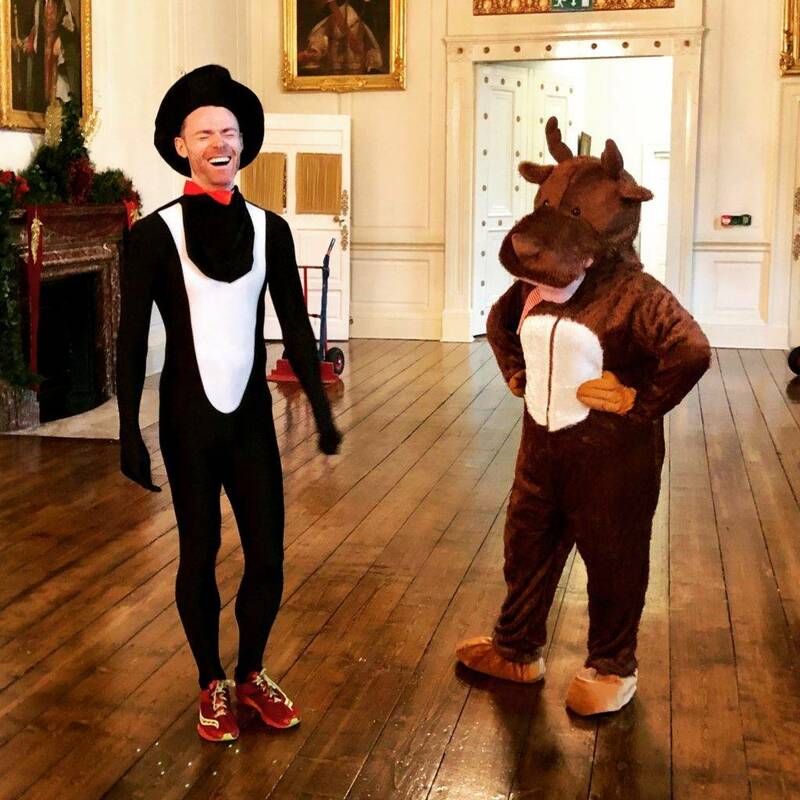 Before we plunge in to 2019 – this blog entry will look back at 2018, a record year in Dublin Castle’s history! We kicked off the year with the continuation of Making Majesty – a fantastic exhibition produced by our curatorial team William Derham and Myles Campell. As part of the exhibition, the Irish Sword of State took up residence on loan from the Tower of London and was on display until April of 2018. This landmark exhibition explored the shaping of the royal and viceregal image at Dublin Castle through architecture, stately ceremonies and furnishings. If you missed the exhibition – you can still get your hands on the official publication Making Majesty: The Throne Room at Dublin Castle edited by Myles Campbell and William Derham, available in all good bookshops. Over in the Coach House, President Michael D. Higgins opened the landmark exhibition Coming Home: Art and the Great Hunger in March of 2018. On loan from Ireland’s Great Hunger Museum, Quinnipiac University – the world’s largest collection of Famine-related art remained on view here until June, during which time over 50,000 visitors viewed stunning works from artists such as Jack B. Yeats and Robert Ballagh. The exhibition proved to be very popular with all of our visitors and can now be visited in Cultúrlann Uí Chanáin an tSeaneaglais in Derry until March 2019. In May, ‘Ireland Salutes John Henry Foley’ took place. This event, hosted by celebrated historian Turtle Bunbury and film maker Sé Merry Doyle brought together a number of leading art and sculpture experts to discuss and debate the works and legacy of John Henry Foley. The audience had the opportunity to view a screening of Sé Merry Doyle’s film, John Henry Foley, Sculptor of the Empire. The afternoon provoked some exciting debate and helped to shine a light on one of Dublin’s most celebrated craftsmen. The summer is always a wonderful time at Dublin Castle. We normally experience a surge in visitors from all around the world and the courtyard is filled with excited holidaymakers from the moment the gates open in the morning. Long stretches in the evening lend themselves well to our events programme, last July we hosted a series of harp events in the Chapel Royal. The O’Donnell sisters delighted audiences each evening with a talk on the history and symbolism of this uniquely Irish instrument. They also performed some well – known pieces, filling the atmospheric surroundings of the Chapel with the magic of the Irish harp. Summer exhibitions included Derek Hill and the view from Donegal, Clay/Works: Ceramics Ireland Annual Members Exhibition, Lucienne Day and the Georgian National Costume exhibition. The education team also took over the Castle with a Viking Summer Camp for young historians which was a great hit with junior historians. The Dubhlinn gardens served as a beautiful backdrop for Chapterhouse’s production of ‘Sherlock Holmes’, rain stayed away while audiences enjoyed the thrill and spills of the theatrical performance. Other theatrical highlights this year included Mouth on Fire’s performance of ‘A Modest Proposal’ and ‘Words Upon the Window Pane’ as part of the Jonathan Swift Festival. We also teamed up with the Bram Stoker Festival for spooky drama in the Chapel and the Fringe Festival joined us for aerial acrobatics in the garden. Culture Night audiences were thrilled by a group of professional actors who took turns reciting the speeches of Michael Collins, Robert Emmett, Hanna Sheehy Skeffington and Countess Markievicz. In August, the State Apartments served as a backdrop for an Taoiseach’s meeting with Pope Francis. Leo Varadkar met with Pope Francis in the Drawing Room, where he also signed the Dublin Castle Visitor’s Book. Following on from this meeting, the two took to the stage in St. Patrick’s Hall, where their speeches were live streamed to the nation. Hundreds of journalists covered the Papal visit to Ireland, with the media centre based also at Dublin Castle. It was certainly an eventful weekend for the Dublin Castle Events Office! The arrival of Autumn brought with it another new exhibition inspired by the classical busts in the Long Gallery of Castletown House. Curated by Mary Heffernan, General Manager Dublin Castle, Heléne Bremer and Nuala Goodman, On a Pedestal showcased the work of contemporary artists exploring the genre of the portrait bust in a variety of different media. Visitors to the exhibition were much enthused by the breadth of work on display – with images appearing all over social media for the duration of the exhibition. Our proud tradition of presidential inaugurations continued this year in November. 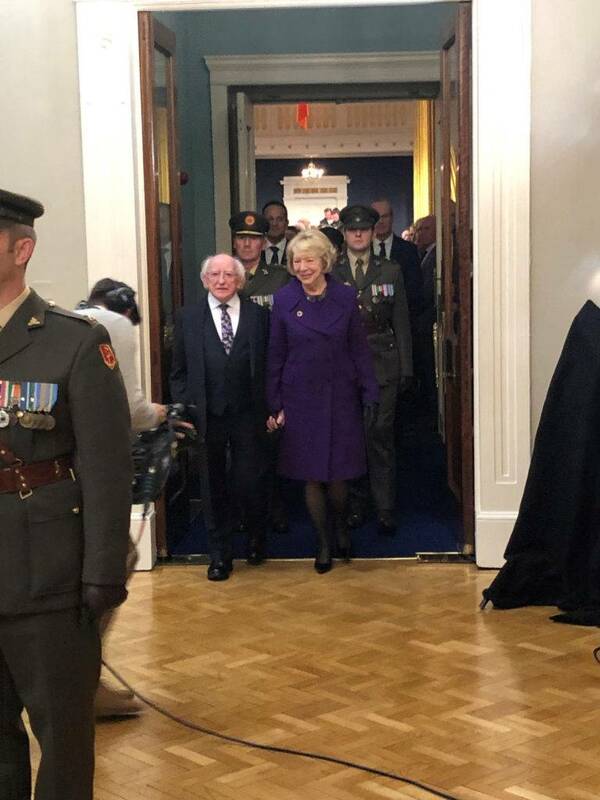 President Michael D. Higgins arrived on the evening of the 11th for the inauguration ceremony in St. Patrick’s Hall.The event was attended by senior members of the judiciary, ambassadors, members of both Houses of the Oireachtas and other invited guests. This was the first night-time inauguration ceremony to take place due to the Armistice Day commemorations taking place that morning. Once the Inauguration event had been completed, staff began work on the Christmas Programme. The State Apartments were decorated to the highest festive standard, while the Chapel was illuminated once more for the display of our Neapolitan Crib. A series of Christmas evenings took place with musical performances in the Chapel followed by refreshments in the State Apartments after dark. These events provided guests with the opportunity to experience the magic of Dublin Castle at Christmas. A new addition to the programme this year was a special event aimed at families ‘A Christmas Adventure at the Castle’. Written by Caoimhe Creed, this interactive visit introduced children to a range of characters such as Holly the fairy, Dancer the Reindeer and Salty the penguin. The kids joined these characters in a quest to find Dancer in time for Christmas Eve. All of the families on the day had the chance to meet Santa at the end, taking home a gingerbread man each for their efforts. A great day was had by all – our events and guide staff had as much fun as the kids did! Don’t forget to sign up to our newsletter to be the first to hear about all upcoming exhibitions, events and activities at the Castle. We have plenty in store for 2019 and look forward to welcoming you throughout the year.